This wallie is just a test that I'd made with my new cloud brushes and this is the result ^^. All done by me ^^, except the tree and grass. They are part of original scan, another grass parties I make with the stamp. Hum.. I'm soory for the quality of scan..-_-... hell, why I found a pretty scan with soo bad quality? Anyway, it is just to all you see and give me your feedbacks ^^, not much than it. Very pretty! 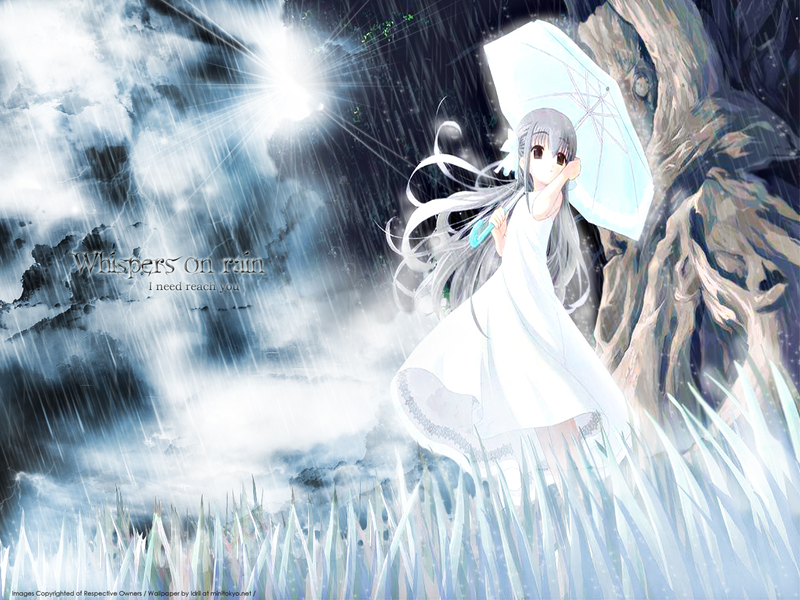 I love the rain & clouds you put there, and the colors definately match with the rest of the wallie. amazing! its great to see your amazing wallpapers...theres so much life and creativity in them! wow! this one is soo pretty! its so amazing how you placed everything! this wall just blows me away! :) good job and keep up the good work! great job on the cloudy sky and rain. it looks really nice and blended together with the scan. nice wallpaper, the effects are very good, and the chara fits well to the scene. Scan is really bad quality, but background is awesome! I like clouds and rain... Hey, how you create such a nice and realistic rain? Anyway, great work and you deserve a fav! OMG! What an extremly beautiful wallpaper! I love the grass and the bakground! You have done an awesomely beautiful work! I love it! XD The way you did everything is like, fantastic! Keep up the beautiful work! Such a beautiful wallpaper I'm sry but it is! very very beautiful wall . . . i just love your calm and sweetie sky! ;) Looks sooooo good, i like grass and rain very much too! I think it is a very beautiful work. it has a lovely calming look to it. wow. Thats so awesome! Cute scan and the rain looks great! Well cool idea. Great Work! ehehe i have also that kind of scan but it was bright.. I agree with people who say that the scan is cute. Holding an umbrella and dress in white under the rain. When the cold wind blows...and the raindrops sing their song upon the luminious grassblades, hitting the umbrella like soft Whispers. Wow ! That is so cool ! Hiya, don't fret over the scan. You made it ! Flawless. Thats nice brushes and wallpaper u made.